It's not quite the Millennium Falcon. Or even an X-Wing. 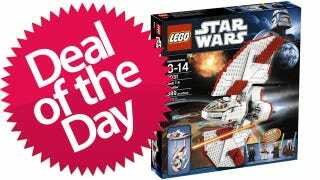 But still, this Lego T-6 Jedi Shuttle set could help you complete your collection of awesome Star Wars Lego ships! So what if the Jedi Shuttle didn't get any fantastically quotable one-liners, or do any amazing feats, and who cares that it only ever appeared in The Clone Wars TV series. It's still important because… well… Star Wars! The $42 set is on sale at a 30% discount. And sometimes, even the most obscure Star Wars ships make awesome Legos.